The Princess Tower in Dubai is over 400 meters (1,358 feet) tall, and currently the world’s tallest residential building. It’s also the second tallest building in Dubai. No wonder these 558 daredevils chose it as their base jumping location. A video has emerged, showing them doing all the crazy jumps and tricks – pyramids, backflips, pull-ups, mass jumps - and it’s incredible. 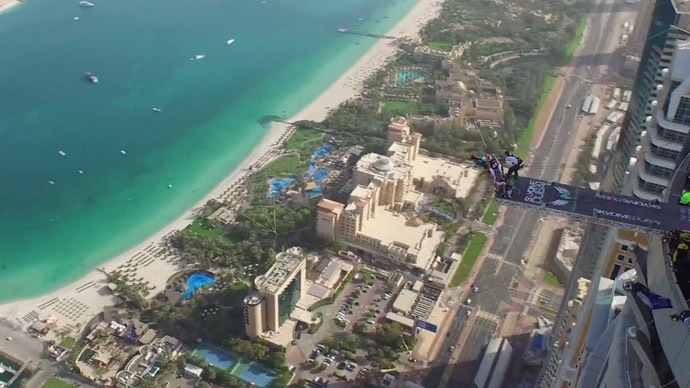 To carry out the jumps, SkydiveDubai and XDubai partnered with DreamJump, and provided a once-in-a-lifetime opportunity for the public to jump off this iconic building. Over 550 jumps happened in just a few days, full of adrenaline, excitement, fear and joy. Local residents enjoyed the stunts, too. “It is an exciting spectacle to wake up in the morning and see people free fall past your balcony,” building resident Saud Al Anazi said.